Ever heard of laughing yoga? If you are more familiar with the yoga, as a form of therapeutic exercise, then this kind is not very much different from it. As suggested by its name, it is a form of therapy, which is induced by laughing. It claims that if you engage in this activity, you would get overall improvement physically and mentally. This started out in a research study done in the 1950’s by L. Ron Hubbard, which introduced the notion that laughing helps to alleviate physical and psychological stress. After some time, a journalist named Norman Cousins, who was then suffering from a degenerative disease, tried and tested the power of laughter as a therapeutic tool to heal him from his diseases. It was a surprise because truly, he was cured and his health improved. Since this aroused the interest of many scientists and enthusiasts, it was further looked at more closely. In 1995, an India-based physician named Dr. Madan Kataria published an article discussing about the discovery of laughter therapy and how this would affect a person’s health. Because people became particularly interested with this, a laughter club was born. Although more and more people joined his sessions, it was a failure at first because the method by which it was approached was wrong. Later on, Dr. Kataria learned about a branch of yoga known as Hasya Yoga (or laughter yoga) and applied this to his therapy sessions. He was helped by his wife who is a yoga instructor and together they built a movement towards self-improvement through laughter yoga. In 1999, a psychologist in Ohio named Steve Wilson asked Dr. Kataria to teach the art of laughter yoga in North America. Since then, Wilson started out his own organization with the same principle but with a different method of engaging in the laughter exercise. Recently in 2004, Sebastian Gentry from Los Angeles trained officially under Dr. Kataria and is now leading professional trainings himself in the United States to make way for more certified instructors who would make laughing yoga more widespread and known all over the world. So far, there are more than 6000 clubs which engage in laughing yoga in 63 countries. So what exactly is laughing yoga? In traditional yoga, you are taught of breathing exercises and proper breathing techniques to release tension and find inner peace and calmness. Instructors also teach specific body movements and contortions, which are supposed to harmonize your body and soul. In laughing yoga, you do not need to learn about such things. There are no complicated lessons that you need to master. You do not even have to wear a specific outfit or have certain tools and paraphernalia. You are not forced into a specific spiritual or religious group or political affiliation. It also does not choose a specific race and everybody is very much welcome. You are also not required to have a background on it or on any other forms of yoga, so you could just join a laughter yoga session if you want to learn more about it. When we laugh our heart out, we also feel that we are very energetic and on a high. This is because our blood supply becomes full of oxygen, which is then transported into all the organs in our body. This would in turn make the organs fully function. Laughter negates the effects of stress in our body. When distressed, we experience more vulnerability to illnesses because our immune and lymphatic systems shut down. We also experience digestive problems such as constipation or loose bowel movement. However, some of those who have already been into laughing yoga discovered that their bodily functions were put back to normal, and have even improved. Some say that when a person has sickness, engaging in laughing yoga would make healing a lot faster, and even cure some minor illnesses. 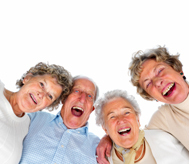 There is some evidence of positive effects of laughter yoga on people suffering from Alzheimer’s disease, many kinds of cancers, psychological disorders, and more. Finally, and in general, laughter yoga enables people to experience the here and now and allows one to live life to the fullest. It makes one joyful and energetic, physically and mentally. The good thing about this is that it does not only take care of the physical health, it also fosters good relationship among people. If you are interested in laughter yoga and would want to try this out, you could find a local laughter club near your neighborhood. Although it might seem weird at first, you would easily be able to adapt and adjust as you go through the sessions. You would find that laughter is really contagious and that it has lots of benefits that you couldn’t say no to. Laughter is indeed the best medicine. For one, it is free and you don’t have to learn complicated stuff or have high educational or professional background. All people from various age groups, genders, and socioeconomic background would be able to experience the wonders of laughter as a therapeutic tool.